When a pregnancy happens and it’s nothing you plan to do in a short time, then you have three options during the first few weeks after conception: carry the baby and keep it yourself, carry the baby and give it up for adoption, or terminate the pregnancy. If the last route is your preference, you now have narrowed your choices down to determining which type abortion is best for you. Whichever method you choose, these alternatives to surgical abortions are safe and effective. Say you want an abortion at 3 weeks pregnant, many doctors will advise you to wait until you are 5 weeks along to have the procedure performed, though others will implement it earlier. You do not have to choose a surgical option; in fact it is recommended that you select one of the other two possibilities which are simple procedures performed in the clinic or physician’s office. One is the aspiration method and the other uses a medication known as the abortion pill. These two methods are safer and do not involve cutting or require full anesthesia. This abortion method is probably the simplest, quickest of the two procedures available at this stage of pregnancy. It takes place all in one visit to the office and only takes about as long as your annual exam to perform. This method can be done either by hand using a tool somewhat like a large syringe or by machine vacuum. 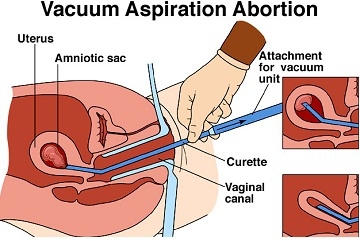 Both methods involve using suction to remove the tissue from the uterus. There are little side effects and you may return to your normal activities right away. This method is considered 98-99% effective. Again, you’re at early pregnancy, like you are 3 weeks pregnant, and want an abortion. 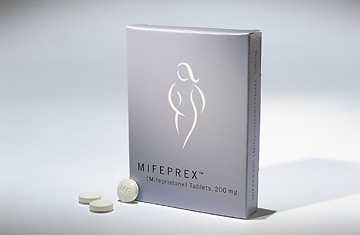 You may choose the abortion pill, also known as mifeprex, mifepristone, RU486, or medication abortion. The abortion pill is a two-step process and is suitable for women up to 7 weeks pregnant. The medication has been approved by FDA and allows you the opportunity to terminate the pregnancy in the privacy of your home. For the first step of this procedure you will visit your doctor’s office. You will be given a pill of mifepristone to take while you are at the office and be sent home with misoprostol to use within the next 24-48 hours. This second medication causes uterine cramping and the pregnancy will be expelled. This procedure causes severe cramping and women may pass clots of various sizes. If you have anemia or other bleeding disorders, this may not be the best option for you. The abortion pill is effective 97-98% of the time. You can expect to bleed for 9-16 days after the procedure is complete. Some women prefer this method because it feels more like a “natural” miscarriage while others opt for it because they want to be in private when their fetus is aborted. This is also a way to stop pregnancy if you are wondering how to stop pregnancy after 1 week.